Well Fringe certainly turned their cliffhangers up a notch with last Friday’s episode. [No spoilers ahead]. September’s revelation to Olivia would have been a nail-biter most weeks, let alone the mid-season hiatus, as S04E08 ‘Back to Where You’ve Never Been’ would have been if not for a scheduling rearrangement stateside. We could have been waiting weeks! Could peter be a shapeshifter? The shapeshifters, as the pawns of their boss, would have a great deal to gain from the universe cracking abilities that Peter was seeking in this episode [see how I didn’t spoil that?] and Peter’s single mindedness certainly emulates that of the aforementioned pawns, not to mention his tenuous, poorly explained return to the show at the beginning of the season. It’s just a thought; weirder things have happened on Fringe, like back in Season 1 when they dropped the bomb that there was a second universe. Another point I’d like to raise is that of the second incarnation of Walternate. Anders seems convinced that this concerned, paranoid Water is genuine. I, however, remain to be convinced. With regard to the future of the show, it has been said in various articles quoting the producers and other notable people’s at FOX that this increasingly likely to be the last season of Fringe, which gives them half a season to wrap up a series. While I can see this as possible at this stage, I think it would be a shame to rush such an intricate plot to a stunted conclusion. 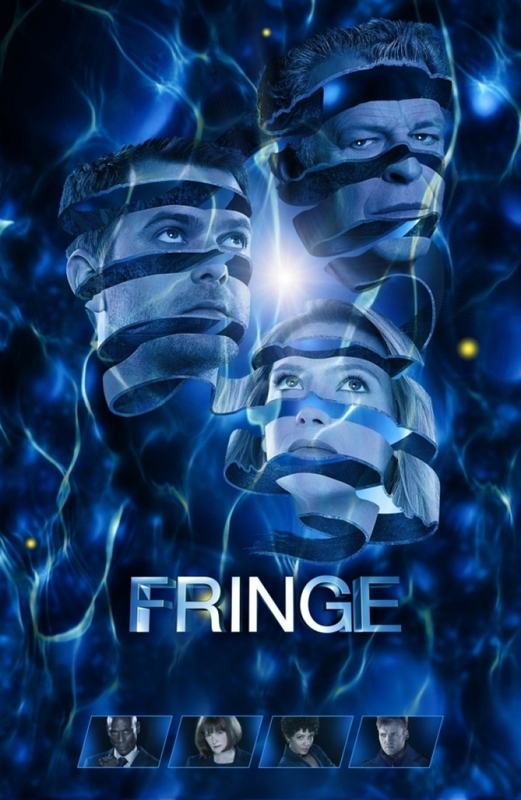 Do transmedia narrative extensions of ‘Fringe’ add or detract from enjoyment? Image source: Fox.com/fringe. 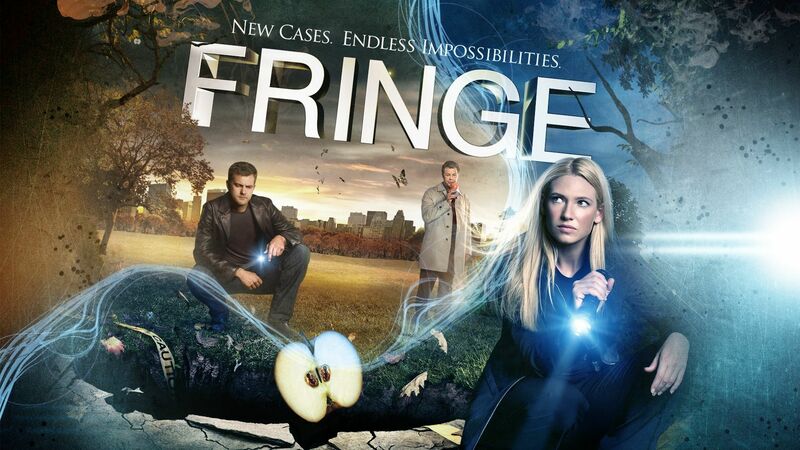 Created and produced by J. J. Abrams, Alex Kurtzman and Roberto Orci, Fringe began airing in 2008 on FOX and has recently been picked up for a fourth season (FOX, 2011). This discussion of narrative extensions will use US TV serial Fringe (Abrams et al, 2008) as a case study. Following the trend for shows that have “tightly interwoven plots, extended story arcs, recurring emphasis on backstory and program history” (Jenkins,2006a) and now nearing the end of its successful third season, the primary text (Fiske, 1987 in Askwith, 2007), Fringe, has numerous narrative extensions, both official and grassroots, and both secondary and tertiary texts (Fiske, 1987 in Askwith, 2007), of which a detailed list can be found in Appendix II. The focus here will be on the two official comic series, Imagine the Impossibilities and Tales from the Fringe and the main Fringe website, FOX, and the grassroots sites Fringe Television and Fringepedia. For the purposes of this discussion, audience/viewers (‘fans’) will be referred to in the following binary distinction: ‘passive’ audiences that wish only to receive the ur-text (Jenkins, 2007a) —or mothership (Toschi, 2009)— to the exclusion of any extensions and ‘active’ audiences for whom the ur-text becomes insufficient to sate their ‘hunger’ for the storyworld. The argument will conclude that, despite the points of detraction raised and having addressed the needs of passive fans, for active fans narrative extensions function to enhance enjoyment, by enabling both solitary extratextual pleasure and by engagement with a multi-functional community of people intellectually and socioemotionally (Baym, 1998 in Jenkins, n.d.) invested in the same storyworld. Active fans can engage with a range of program extensions (see Jenkins, 2007b) that broadly serve to fulfil fans’ needs for two things: storyworld knowledge and storyworld community, that is, a sense of “social and civic involvement… more immersive, enjoyable sense of entertainment.” (Ems, 2007:4). Storyworld knowledge refers to the desire for the acquisition, distribution and discussion of canon material, including reviews, speculation on motivations and future occurrences with a community of other interested individuals. Murray (n.d., in Jenkins, 2009b) calls this the ‘encyclopedia impulse’ and the resulting knowledge pools are what Levy terms ‘cosmopedias’ (1997, in Jenkins n.d.). These activities often take place within predisposed/dedicated areas, both official (FOX, Fringe Division) and grassroots (Fringe Television and Fringepedia to name just the most comprehensive). Such areas and the people who frequent them are referred to as communities and these communities are lived largely online, where there are very low barriers to participation (Jenkins, 2006c) for anyone likely to watch Fringe. Communities arise from these shared knowledge pools of individuals and enable engagement with the text in the above ways, plus as enabling participation in various subtextual games (e.g. ‘eastereggs’ like the commercial-glyph decoding (see Appendix I and II), hidden glyph and Observer spotting and, retrospectively, next episode clues). Many of the sites link to each other, e.g. 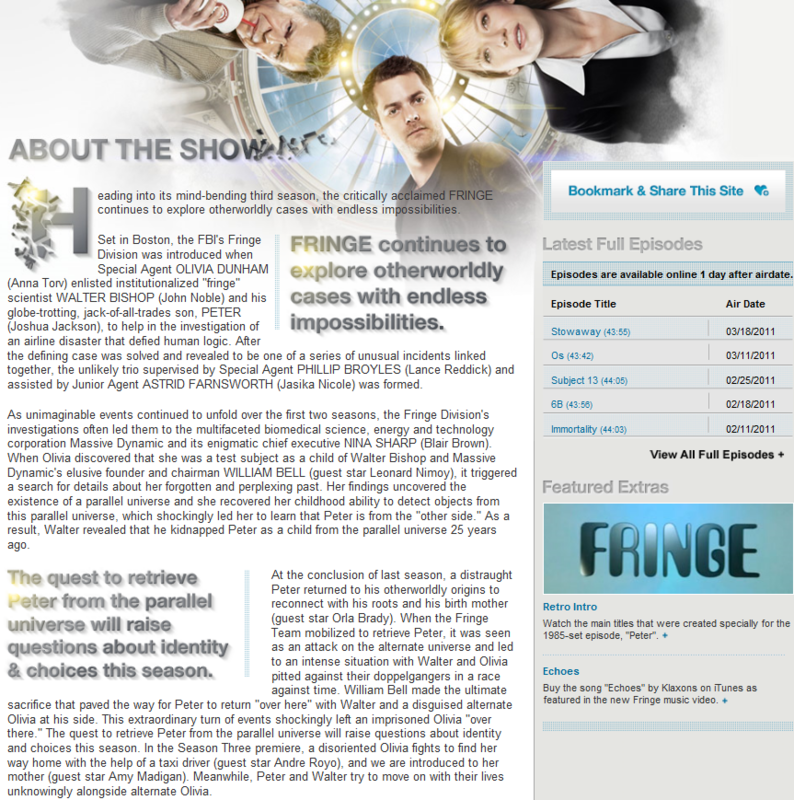 Fringe Television has a comprehensive link list at the bottom of the ‘Fringe eastereggs’ page to both unofficial and official sites (including the alternate reality games via MassiveDynamic.com and ImaginetheImpossibilities.com), they host Fringe Benefits Inc podcasts, the Fringe Wiki tab is a direct link to Fringepedia and so on. This can be compared to FlashForward, a show whose narrative extensions were mainly notable by their absence, much to the disappointment of fans who have come to expect transmedia extensions (Jenkins, 2009a). Operating on the principle of worldbuilding (Freeman, 2008, in Toschi, 2009) narrative extensions of Fringe add to the enjoyment of fans by allowing them to not only immerse themselves in a complex storyworld by offering supplementary information/activities, but also to ruminate on possible directions the plot may take and motivations the characters may have. Sometimes this speculation germinates fanfiction. “Fan speculation may […] seem to be simply a deciphering of the aired material, but increasingly, speculation involves fans in the production of new fantasies” (Jenkins, n.d.) which may serve to fill perceived gaps via the tertiary texts (Fiske, 1987 in Askwith, 2007) that are fanfiction (Jenkins, 2007a). Fanfiction.net alone has 2093 stories based in the Fringe universe(s). The main offline extension of Fringe is the comicbooks, which contribute an insightful, though not essential, window into the backstory of some of the main characters (Walter Bishop and William Bell), but also standalone stories about events that form ‘the pattern’ happening to otherwise unmet characters. Jenkins (2006b) believes comics can be used to fill in gaps in a story and to expand the timeline and the Fringe comics fulfil this function, showing that they are a contribution —not a leech— of the ur-text. Thus far there is no evidence that fan action (e.g. discussion boards or fanfiction) has altered the content of the TV show, however it has had an impact on the show’s longevity. Grassroots movement ‘the Fringe Movement’ was born in response to FOX’s decision to move the show to the ‘Friday Night Death Slot’. Dependent on ratings for survival, Fringe needed to keep up viewer numbers so the various grassroots Fringe sites began a campaign (Jenkins, n.d.) to promote the show and do just that (The Fringe Movement, 2011). Extensions, however, do have an effect on the interpretation of the ur-text content. The comics allow for a new understanding of the relationship between Bishop and Bell and the online discourse seems to offer almost as many different interpretations of the ur-text as there are people with opinions of it. Jenkins (n.d.) states that participatory culture is forming around horizontally integrated media that encourages “the flow of images, ideas and narratives across multiple media channels and demand more active modes of spectatorship” (emphasis added). Jenkins also believes that there is no single ur-text in a transmedia narrative and that the story cannot be fully experienced without consuming all segments (2007a, 2009d). This certainly is a problem if (passive) viewers just want to watch the show, as Bordwell (in Jenkins, 2009c) contends. With the exception of the comics, you do have to watch the show to enjoy the extensions, but as Ross (2008, in Jenkins, 2008) asserts, with Fringe “you don’t have to go online to enjoy the show”. In this respect there is no need to seek out extensions to enjoy the Fringe story and as long as etiquette is followed with regard to signposting spoilers (Gray and Mittell, 2007), passive audiences do not need to engage with extensions at all if they do not wish to, thus extensions are not a detraction from enjoyment. The exception to this was the much slated ‘Twitter TV experiment’, where a live Twitter debate regarding the program was displayed on the bottom of the screen as the episode was broadcast. Audiences found this annoying and distracting and subsequently the experiment was dropped (Eaton, 2009). Extensions such as merchandise can generally just be seen to capitalise off the success of the show, though in some instances the term ‘profit’ may be going a little far as oftentimes e.g. desktop wallpapers are free to download or the result of engaging with other extensions, e.g. the hidden glyphs game on the FOX site. Profit may be accrued by the inclusion on DVDs of ‘bonus’ material such as behind-the-scenes footage and blooper reels, which do not contribute to the actual narrative being told, but do contribute to the knowledge pool of fans and thus their holistic experience. In conclusion, narrative extensions are engaged with by fans who are excited/intrigued by the storyworld and desire either to expand their knowledge of a world or to share their knowledge, feelings and thoughts regarding the narrative with a community of other fans, to fill in gaps in the narrative (either by consuming more canon material or by creating it, as in fanfiction). Viewers who do not want to use narrative extensions do not have to to enjoy the story and can easily avoid extensions, including spoilers, so long as etiquette is not breached and they are clearly signposted. Willis, G. S. (22nd April 2011) Do transmedia narrative extensions of ‘Fringe’ add or detract from enjoyment?, The Third Word. Available from: https://the3rdword.wordpress.com/2011/04/22/fringe-narrative-extensions/. Abrams, J. J., Kurtzman, A. & Orci, R. (Creators and Executive Producers) (2008) Fringe [television series], Bad Robot Productions, Warner Bros. Televison, Connecticut and Vancouver, FOX Broadcasting. Askwith, I. (2007) Televison 2.0: Reconceptualising TV as an Engaging Medium, Massachusetts Institute of Technology. Available from: http://cms.mit.edu/research/theses/IvanAskwith2007.pdf. Accessed: 24th March 2011. Eaton K. (4th September 2009) Fox’s Twitter TV Experiment Tweets Its Way to Epic Failure, Fast Company. Available from: http://www.fastcompany.com/blog/kit-eaton/technomix/foxs-twitter-tv-overlays-tweet-their-way-epic-failure. Accessed 11th March 2011. Ems, L. (2007) Television and Interactivity: Patterns and Categories in the United States, T585 Interactivity and New Media Research Paper 1. Available from: http://www.gigaart.net/LindsayEmsInteractiveTVReview.pdf . Accessed: 24th March 2011. Fanfiction.net stories on Fringe. Available from: http://www.fanfiction.net/tv/Fringe/. Accessed 28th March 2011. FRINGEonFOX (25th March 2011) Fox renews “Fringe” For Fourth Season – in Both Universes. Available from: http://www.facebook.com/notes/fringe/fox-renews-fringe-for-fourth-season-in-both-universes/10150132343134271. Accessed 25th March 2011. The Fringe Movement (2011) Project Fringe Friday. Available from: http://fringenetwork.com/. Accessed 26th March 2011. FringeTelevision (2008) Fringe Radio Spots – Find The Pattern, FringeTelevision. Available from: http://www.fringetelevision.com/2008/06/fringe-radio-spots-find-pattern.html. Accessed 27th March 2011. FringeTelevision (2008) Two New Fringe Radio Ads, FringeTelevision. Available from: http://www.fringetelevision.com/2008/07/two-new-fringe-radio-ads.html Accessed 27th March 2011. Gray, J. & Mittell, J. (2007) Speculation on Spoilers: Lost Fandom, Narrative Consumption and Rethinking Textuality, Particip@tions. Vol. 4, Issue 1. Available from: https://mybu.bournemouth.ac.uk/webapps/portal/frameset.jsp?tab_tab_group_id=_12_1&url=%2Fwebapps%2Fblackboard%2Fexecute%2Flauncher%3Ftype%3DCourse%26id%3D_33570_1%26url%3D. Accessed 18th March 2011. Jenkins, H. (23rd August 2006b) Comics and Convergence Part Two, Confessions of an Aca-Fan. Available from: http://henryjenkins.org/2006/08/comics_and_convergence_part_th.html. Accessed: 22nd March 2011. Jenkins, H. (6th September 2006a) Television Goes Multiplatform, Confessions of an Aca-Fan Available from: http://henryjenkins.org/2006/09/television_goes_multiplatform.html Accessed: 22nd March 2011. Jenkins, H. (2nd October 2007b) Announcing Futures of Entertainment, Confessions of an Aca-Fan. Available from: http://henryjenkins.org/2007/10/announcing_futures_of_entertai.html Accessed: 22nd March 2011. Jenkins, H. (11th October 2008) Inviting Our Participation: An Interview with Sharon Marie Ross (Part Two), Confessions of an Aca-Fan Available from: http://www.henryjenkins.org/2008/10/an_interview_with_sharon_marie_1.html Accessed: 22nd March 2011. Jenkins, H. (13th September 2009c) The Aesthetics of Transmedia: In Response to David Bordwell (Part Two), Confessions of an Aca-Fan. Available from: http://henryjenkins.org/2009/09/the_aesthetics_of_transmedia_i_1.html Accessed: 18nd March 2011. Jenkins, H. (16th September 2009d) The Aesthetics of Transmedia: In Response to David Bordwell (Part One), Confessions of an Aca-Fan. Available from: http://henryjenkins.org/2009/09/the_aesthetics_of_transmedia_i_2.html Accessed: 18nd March 2011. Jenkins, H. (12th December 2009a) The Revenge of the Origami Unicorn: Seven Principles of Transmedia Storytelling (Well, Two, Actually. Five More on Friday), Confessions of an Aca-Fan. Available from: http://henryjenkins.org/2009/12/the_revenge_of_the_origami_uni.html. Accessed: 22nd March 2011. Jenkins, H. (12th December 2009b) Revenge of the Origami Unicorn: The Remaining Four Principles of Transmedia Storytelling, Confessions of an Aca-Fan. Available from: http://henryjenkins.org/2009/12/revenge_of_the_origami_unicorn.html. Accessed: 22nd March 2011. Jenkins, H. (n.d.) Interactive Audiences? The ‘Collective Intelligence’ of Media Fans, Publications. Available from: https://mybu.bournemouth.ac.uk/webapps/blackboard/content/contentWrapper.jsp?content_id=_493973_1&displayName=Jenkins+on+collective+intelligence&course_id=_33570_1&navItem=content&href=http%3A%2F%2Fweb.mit.edu%2Fcms%2FPeople%2Fhenry3%2Fcollective%2520intelligence.html. Accessed 24th March 2011. Toschi, A. (2009) The Entertainment Revolution: Does Transmedia Storytelling Really Enhance the Audience Experience? http://efficientcreativity.files.wordpress.com/2009/05/transmedia-storytelling.pdf Accessed 22nd March 2011. Tales From the Fringe web comic – monthly 6-issue limited edition. the Massive Dynamic (MD) website alternative reality game (ARG). Massive Dynamic is the fictitious biomedical research company that serves as antagonist for the first season. At time of writing, the website has an employee access point (which currently denies all access attempts) and a careers section where fans can submit their resumes. completethepattern.com: a website where on completion of a puzzle, users can download an exclusive screensaver and twitter, MySpace and Blogger skins. Twitter accounts: @FRINGEonFOX (main); @JWFRINGE & @JPFRINGE (producers); @LabDad1, @FringeLabRat, @PeterBishop1 (characters) that are used for that are used for promotion and interaction with fans, including encouragement for fans to play the ‘spot the Observer’ game. Facebook: (http://www.facebook.com/fringe) used for promotion, interaction with fans and also to encourage fans to play the ‘spot the Observer’ game. MySpace: http://www.myspace.com/fringeonfox . Largely unused currently. Spot the Observer game – the Observer, occasionally a supporting character, is hidden in every episode that he is not featured in and viewers attempt to spot him. Screenshots of his sightings are posted on fans sites such as FringeTelevision. Glyphs code game – The glyph code is a simple substitution cipher. The decoder (Appendix I) is available from Fringepedia. The glyphs are shown immediately prior to the commercial breaks in the original broadcast and together spell out a word that is pertinent to the theme of the particular episode. Next episode clues, e.g. the periodic table in the background of episode 315, with episode 316 being titled Osmium. Show glyphs hidden in the back- or foreground of a scene in the episode. These, again are posted on fans sites such as FringeTelevision. These enigmatic ads, did not actually name the show, but the repeated phrase ‘find the pattern’ served to intrigue listeners who would then search for the phrase online and find one of two identical websites (see Appendix II) that played trailers for the show, introduced the glyphs and the comics (FringeTelevision, 2008)). Through these paratexts, audiences got a taste of what was to come and were actively invited to participate (Jenkins, n.d.). smart/iPhone apps (e.g. 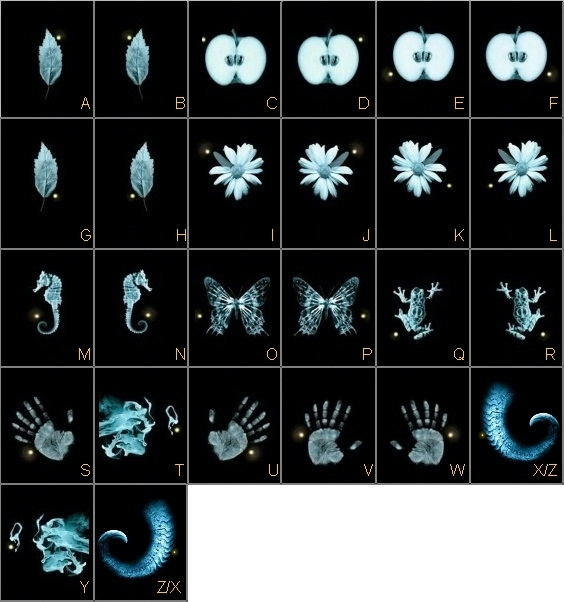 glyph decoders). The Fringe Movement: http://thefringemovement.qhub.com. The Fringe Qhub is a place for fans to ask questions and share theories about the show. A Twist of FRINGE: Amidst Tragedy An Unexpected Love Story Blooms | the TV addict – by Tiffany Vogt. There’ll be more from me soon, particularly on Fringe, which I have been watching from the edge of my seat since Christmas, but haven’t had the time to post about.